Find out how the activity feed has improved and multiple admin email notifications help your organization! We know that it's important for our users to be able to easily see campaign activity, not only so you keep track of campaign progress but also so you know what actions you can take to best communicate with your community. We're excited to announce two new improvements to our platform capabilities that both work to help you keep tabs on your campaign activity! The Activity Feed helps you keep a pulse on exactly what's happening on your fundraising campaign. While previously the Activity Feed showed any recent activity, the Activity Feed now aggregates information based on date and type of activity. Incoming donations, fundraisers joined, or blog posts created are grouped together making information easier to digest. With this added functionality, you have more control over how you view your campaign activity, so you can easily see donation volumes, find your newest fundraisers, and view blogs posted by your fundraisers. You can quickly navigate to specific activities to take action on them, and thereby improve your communications to develop donor and fundraisers relationships. 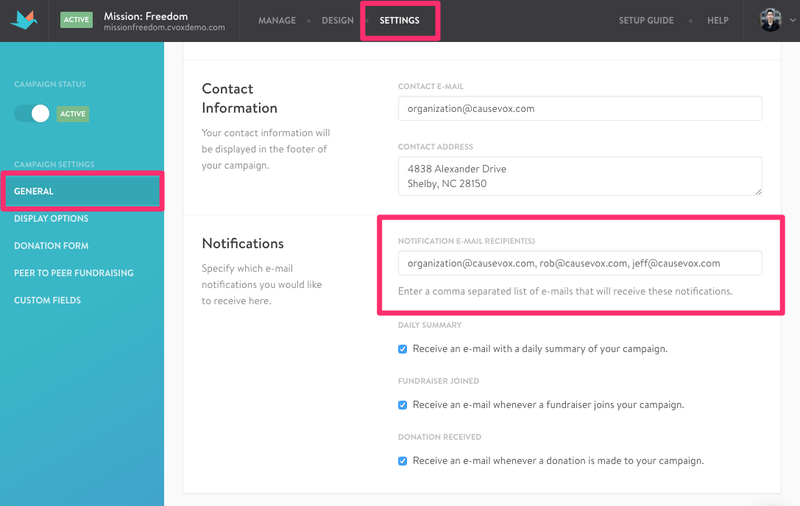 We have notifications in place already that help your organization be alerted of campaign activity such as donation, fundraisers joined, and a daily summary to help you best keep tabs on your campaign and take action whenever needed. We're excited to announce we've enhanced our notification experience so that not only does the account owner receive notifications, but your other team members can receive those notifications as well! In the "Notification Mail Recipients" text box, add the email addresses of any Admins you'd like, separating each email address with a comma. Save your Settings, now any campaign activity notifications will go to your admins! By adding in multiple Admins, you're able to break down silos and allow multiple departments to be notified of campaign activity so they can keep track of the campaign's progress and use the information to best plan communications. With your team informed on campaign activity, you're able to increase productivity and create communications across departments that can help you build donor and fundraiser relationships and further increase campaign activity. We're excited to introduce these new features as an update to functionality that works to enhance communications for all our users. By viewing your Activity feed and adding multiple Admins, you'll be able to further engage your audience in your campaign and raise more funds!